The Playgro High Chair Spinning Toy offers two fantastic toys in one. The suction base easily attaches to any surface, great for entertaining baby whilst dining in or out. 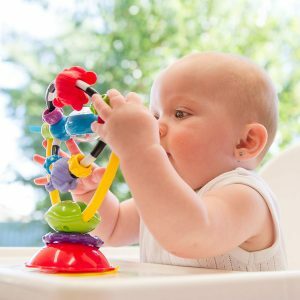 The detachable rattle is the ideal shape for baby to spin and swing encouraging gross motor skills, or the click-clack beads and silky ribbons can be used for fine motor skill development. A great toy for baby’s 1st birthday, a baby shower or as a developmental experience for baby.